I love that line. Any true hip hop fan knows that after Jay-Z utters those lines, one of the hottest beats of all time drops (a sample from “Make the Music” from Biz Markie) and the party really gets started. As employees looking to build businesses on the side, many new entrepreneurs tend to lose the focus needed to take their businesses where they want them to go. Often, they suffer from “Bright Shiny Object Syndrome”. This occurs when new, enticing, interesting options come along that appear to be the answer to all of their business woes. They can come in the form of a new tool you’ve discovered, a new class/certification, a new method for conducting business, or even a new “guru” that has hit the scene and appears to have a hot following. These objects gain attention very easily and are almost hypnotic in the way that appear to be “the exact thing” that we need to bring our business to the next level. Suddenly, you are filled with so many ideas that your head is spinning! But at the end of the day, these are not panaceas, they are DISTRACTIONS!! As you chase these objects in an effort to make your business more lucrative, you actually pile on more tasks to take on and ultimately your original plan becomes distorted and even unrecognizable. 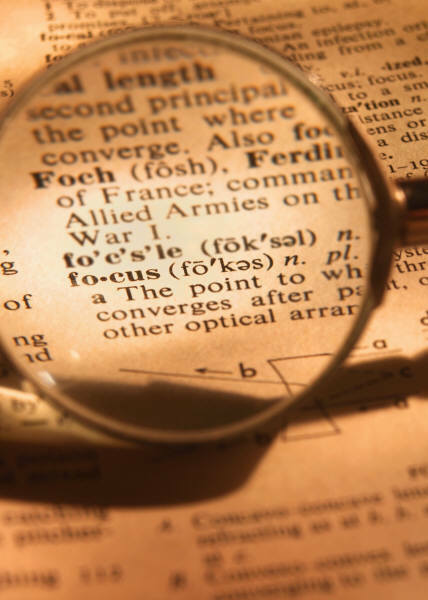 The cure for Bright Shiny Object Syndrome is FOCUS. (1) Be clear about your mission and intentions for your business. (2) Think about what your original goals were and re-visit your plan to achieve those goals in the time-frame you set for yourself. (3) Make a commitment to yourself to not take on any additional tasks until you complete your original set unless you’ve decided that your business must evolve. • Is this new option right for my me and my business? • Do I have the time, resources, energy, and money to put into this to make it successful? • Do I have too many open projects sitting on my desk that need to be finished before I begin something new? • Do I have the ability to finish this new project, plus implement and maintain it? • What has to drop off my radar in order for me to start something new? Above all else, try not to fall into the temptation to take on EVERY opportunity that comes your way. With clarity of intention and purpose, you will be able to easily distinguish the moves that are necessary to fuel your new business. Great insight, and fun trivia on Jay-Z. You are so right, it’s really easy to think you’re doing something productive to further your business, when really all you’re doing is wasting time. Listening to webinars from the newest “expert” is one of my biggest shiny object distractions. Usually it ends up being the same info, recycled by someone new. A waste of time. Very timely post. It is is so easy to lose sight of what your original goal is by the latest, newest thing. I completely agree with taking the time to go back and revisit your goals. 1. Does this take me closer to my goal or farther away from my goal. 2. When it comes to buying the latest newest product, course or class. I ask myself Is this something that I need right now in by business that I will put to use? These are questions from Lynn Terry, they have made a world of difference. I recently had to made a decision regarding my business. I was asked to ship my product out of state, but I am no where at that level. I am local for now but thought how can I pass up this opportunity? I then thought of my original goals for my company and said to myself, shipping is not a priority now. I politely responded to the person with the order letting them know I was not at the shipping stage yet and asked that they check back later as we are researching this option. I felt so much peace after I made that decision! Staying focused is key for sure! Such a great post Monique. I have been “victim” to the “bright shiny object” this year and most recently in the last couple of months have I realized that I need to stay in my lane and focus on what it is I’m trying to accomplish. I recently had a opportunity put on the table, that seemed GREAT when I first heard all the details about it; however, I decided to take my time and really think about what it would cost me to put my energy toward it. I asked myself some of the same questions you stated and I decided it would take too much focus and energy from my business goals and respectfully declined it. I have narrowed down my options to focus more on the two biggest things I have passion about and see myself doing more long-term.